Recently, my life has been just about perfect. I love being the Clover Ridge Library’s head of programs and events. I have a great boyfriend and wonderful friends. And then my father, whom I haven’t seen in years and happens to be a thief, shows up at my cottage wanting me to help him get his half of a heist of gems from his crooked partner. As if I would ever do anything like that! When my father’s partner-in-crime is found murdered, my father becomes suspect number one. Now crooked as his is, my father is no murderer and I feel obliged to clear his name. I must find those gems before my father or any of the several people searching for them finds them. Yes, actually, since I helped solve a cold case and a recent murder in my community a few months ago. Who would you say is the least pleased about your additional career choice of amateur sleuthing? Or is detective work your only career? I’d say Lieutenant John Mathers, the police chief of Clover Ridge Police Department, would rather I didn’t get involved in his cases. John is a good friend of my Uncle Bosco and he worries about my safety. Some of us have grown up in a dysfunctional family as I did, but that’s no reason to let it interfere with having a wonderful, worthwhile rest of your life. Try not to be bitter; allow yourself to have loving, caring relationships. Unless it would be toxic to let a family member back into your life, be willing to give this person another chance if he/she has changed. What was one lesson you learned during this challenging time in your life? I realized how much I love my father. Growing up, I was very hurt because he was never around, even when he wasn’t in jail. Spending time with him as an adult, I saw that he loves me and shows it as best he can. Much as I’d like it, I cannot expect him to behave like a typical father. I intend to continue sleuthing when the need arises. To be perfectly honest, I LOVE sleuthing. It’s challenging and exciting! It’s a new year, and The Self-Rescue Princess has even more fabulous heroines for you to meet. Our first for 2018 is Piper Prescott. Welcome, Piper. Please tell us a little bit about what is currently going on in your life. Over the past year, my relationship with the often infuriating Chief of Police, Wyatt McBride, has mellowed into a friendship of sorts. I’m still distracted by the darn dimple of his that makes an appearance now and again when he smiles a certain way, but I’m always secretly pleased when he pops into Spice It Up!. Goes to show my female hormones haven’t stopped functioning yet. Being the owner of a little spice shop here in Brandywine Creek, Georgia, keeps me on my toes. My daughter Lindsey is a high school senior now, and she keeps me pretty busy, too, with college admission forms and things like senior prom. In a weak moment, I even volunteered to be on the prom committee. As though my life wasn’t full enough already, a local Realtor showed up dead recently in McBride’s fishing hole and now the whole town is regarding him as a person of interest. How’s that for turning the tables on my favorite lawman? What made you take on such a risky endeavor? I don’t know what was riskier, opening my own business following a divorce or trying to solve a murder. I only know when folks started suspecting Wyatt I couldn’t simply sit idle. I may have had my run-ins with the man but I knew deep-down he wasn’t a killer. No way! Brandywine Creek is no bigger than a flyspeck on a map and is post card pretty. Sure every city has crime, but here it consists of mostly petty stuff. Murder happens elsewhere, not in Brandywine Creek. I’m a shop owner not some fancy detective. I’m naturally curious, like to ask a lot of questions (even the unpopular ones) and Spice It Up! has become a place where women like to gather—and gossip. Few things I love better than fitting together the pieces of a good puzzle. Just about everyone I know casts aspersions on my avocation, but if I had to pick three people here goes: Chief of Police, Wyatt McBride tops my list. McBride’s given me more lectures than I can count on the pitfalls of playing amateur sleuth. They all boils down to him telling me that I should mind my own business and leave the crime solving to the pros. He’s been especially testy since getting shot during a showdown I had with a former hitman. Next on my list would be my ex-husband, C.J. Prescott. He thinks I’ve completely lost my marbles and doesn’t mince words. Coming in third would be my daughter, Lindsey Nicole. After some of my escapades, she had the nerve to tell me that I’m the troublemaker in the family and in need of a curfew. Imagine! Stubbornness can be both a curse and a blessing. I persist in finding answers to vexing questions when another might take a step back and let things go. It’s also lead me into some pretty dicey situations. I tend to act impulsively on occasion and become a risk taker, often to my detriment. Thank you for stopping by The Self-Rescue Princess today. Today, I’m doing a holiday review of the Discombobulated Decipherers. The reviews I write are a little different as I like to focus on the heroines, or as the case is during the holiday season, I comment about the holiday spirit in the story. The Discombobulated Decipherers is a fun, quirky story with plenty of holiday charm. The main element of the story is the mystery, who killed Ernest the elf, but it always maintains its lighthearted feel, perfect for readers who prefer to read less angst during this time of the year. The reader can follow along with the characters as they try to uncover the puzzle of who killed Ernest and also if an item they keep stumbling upon has anything to do with the murder, or with the history of the town. (I don’t want to inadvertently give a spoiler so am not mentioning the item.) The holiday season is important to the story so it really lends to the atmosphere of the book. 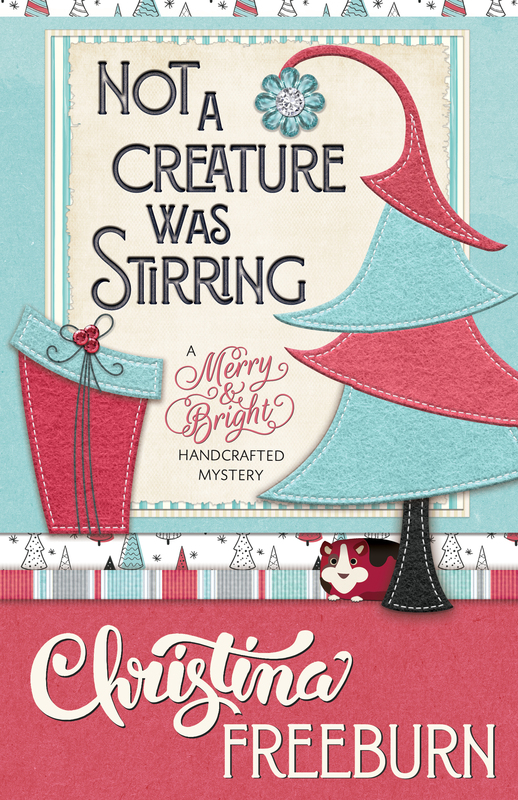 The mystery and the holiday aspect of the story blended together perfectly, and I don’t think either would’ve worked without the other which is something I really enjoyed about the book. Welcome to the Self-Rescue Princess, Cat. I know the holiday season is extremely busy for many people so I’m so happy you made time to chat with my readers. My dad, whom, I’ve spoken to about three times in the past ten years, was sure someone was trying to kill him. My life as a horse trainer in Tennessee had become confusing, due to some unexpected personal relationships, so I jumped at the chance to “run away” and visit Dad at Canterbury Park, a horseracing track in Shakopee, Minnesota. Turns out my dad was right, but it took the help of my Tennessee friends and the (possibly) psychic mare, Sally Blue, to figure it out. Well, he’s my dad. Biological, at least. After my mom died when I was nine, Dad pretty much abandoned me to “the drink,” as he calls it. My feelings about him are complicated, and even though I absolutely want to stay mad at him for the rest of my life, I don’t want anything bad to happen to him. Not ever! But my ex-movie star neighbor was killed and I stumbled across her body. Then there was a murder at a horse show, and after that my best friend, country music star Melody Cross, was killed. What was I supposed to do? Just sit back and watch the police make a mess of things? No offense to my friend Deputy Martin Giles. He’s one of the good guys. I train show horses full time. Or, at least, that’s what I am supposed to be doing. Definitely, my barn manager, Jon Gardner, is not pleased when I start to snoop. I understand his concern, as the horses need me and all my undone chores fall to him. Jon also has feelings for me that I am not sure I reciprocate, but he is a dear friend. Well, I have this teensy problem with anger management. My Irish nature allows situations to build and then everything explodes out of me. I’m working on it, though. I’ve also been known to break and enter (make that snoop) uninvited through my neighbors’ homes. But it is all with the best of intentions––and with their best interests in mind. On the good side, I am very loyal and have a strong sense of right and wrong. And, horses and dogs like me. My grandmother raised me to be self-sufficient. As she used to say, “Never underestimate a Southern woman. She’ll rip your heart out, show it to you, and then bake it in a pie.” I guess two out of three isn’t bad. I never got the hang of cooking. But, my grandmother’s sentiments ring true all the same. It’s important to me to know that I can depend on myself in any situation. And yes, I’ve had to be rescued a time or two, but I’ve done more than my share of rescuing in return. What one advice/wisdom would you like to pass onto young women? Be who you are, and be proud of you. Then make informed decisions that will increase your pride in yourself, not decrease it. And, when the scumbags come crawling into your life, swat them away. You deserve better. Not to sit too close to my potential step-mother’s dog. A second lesson was not to assume anything. At all. Facts are what count. I never intend to get involved, but it seems that people I know are always dying. Jon strongly prefers that I do no more sleuthing, but if a wrong has been done to a friend I feel compelled to help bring the perpetrator to justice. After all, that’s what friends do. It’s here, it’s here! Release day for Altered to Death, the sixth book in the Scrap This Mystery Series. I still have a hard time believing that the sixth book in this series is out. It seems not too long ago I was angsting over the first book finding a publisher and now the series has six titles (Cropped, Designed, Embellished, Framed, Masked, and now Altered is added to the family). Even knee-deep in planning her wedding, Faith Hunter finds herself distracted by the town scrapbook she was commissioned to create. Eden’s oldest mystery, the founding family’s exodus nearly a hundred years ago, remains unsolved. When a search through the family’s abandoned mansion leads to the uncovering of bones on the property and ex-boyfriend Steve Davis announces a surprise heir has staked a claim, Faith is determined to dig up the truth left behind. Meanwhile, family friend Wyatt Buford asks Faith to look into his deadbeat father’s disappearing act and his connection to the murder. Her quest for answers unearths secrets past and present that some would prefer stay buried at any cost. Faith’s resolve to present the facts and nothing but about Eden’s history could lead to her own future being cut short. December 5 – 3 Partners in Shopping, Nana, Mommy, & Sissy, Too! To celebrate Altered’s release, the ebook edition of Designed to Death (Book 2 in the series) is on sale for 99 cents! The sale price is for a limited time.